The Cleito Pro was released many weeks back which introduced the first Aspire Mesh Coil. The tank and coil received fantastic ratings across the vape industry. It was therefore a matter of time before we unleashed the Cleito 120 Pro Tank on the world and here it is. 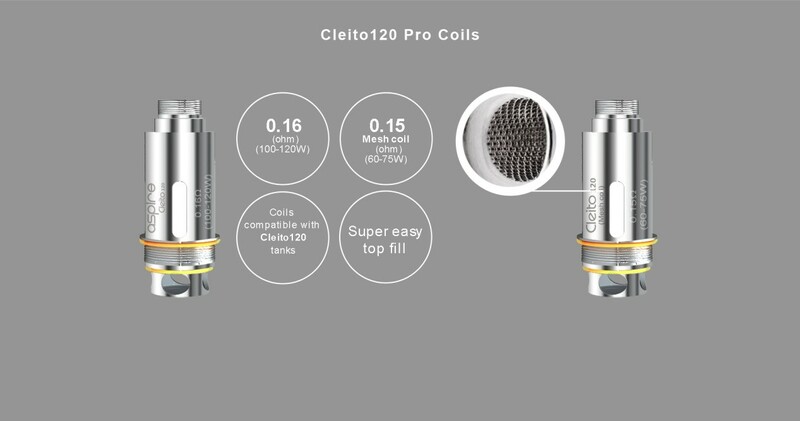 Athestically the Cleito 120 Pro continues the same look and feel as the standard Pro but this houses the all new Cleito 120 Pro Mesh Coil which delivers flavours at levels stock coils have never hit. Rated at 0.15ohm, designed to deliver ultra stunning flavour and dense cloud production. The tank also comes with the original 120 coil which to this day is still one of the much loved stock coils on the market. The coils are also compatible with the original Cleito 120. Then simply slide the sleeve back down and let the juice soak into the coil for 5 - 10 minutes.